This may be one of the best tasting protein powders on Earth, but the ingredients list gives some people pause. It’s an enormously popular protein powder but the ingredients list, which clocks in at well over thirty, gives some people pause. 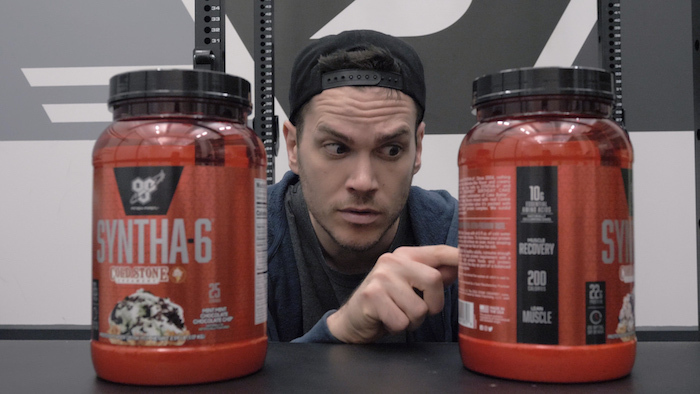 Which begs the question: should artificial ingredients actually stop you from taking a supplement? 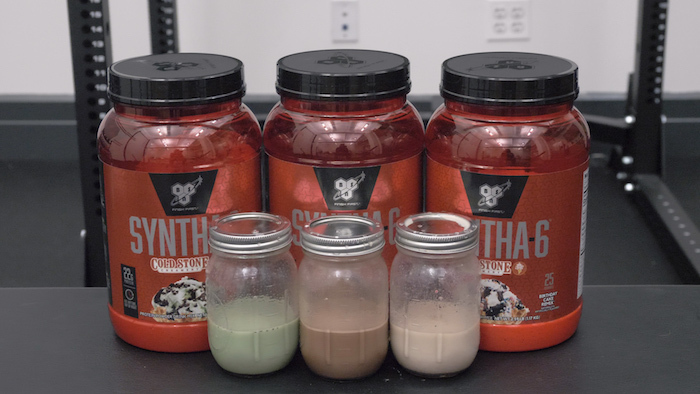 Here we’ve taken a close look at five flavors: Chocolate Milkshake, Banana, and BSN’s collaboration with Cold Stone, which produced Mint Mint Chocolate Chocolate Chip, Birthday Cake Remix, and Germanchökolätekäke. There’s a lot to talk about with this product, but in short: it’s well priced, extraordinarily tasty, and provides a mixture of fast, medium, and slow digesting proteins. Let’s take a closer look at what makes this so popular. What’s unusual is that this shake isn’t low-carb, but it’s not high-carb either. 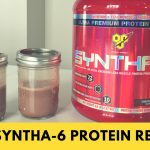 A lot of post workout protein shakes usually have at least twice the carbs as protein, but this has 15 grams of carbs and 5 grams of fiber, so around 10 grams of net carbohydrates. You’re looking at about 9 calories per gram of protein, so it’s not as much pure protein as many of its competitors. Some nice bonuses: one serving also has 15 percent of your daily calcium, 8 percent of your daily iron, and 6 percent of your magnesium. Then there are more questionable qualities: a scoop has about 220 milligrams of sodium (that’s 9 percent of your RDI) and 70mg of cholesterol, which is 23 percent of your RDI. Since some folks like to find new sources of sodium and cholesterol (the body does need them, after all) we won’t say these are negative qualities, but they are components you might want to pay attention to. The ice cream flavors have well over forty ingredients and the others have over thirty. Let’s start with the first: protein. This isn’t just a whey protein powder. 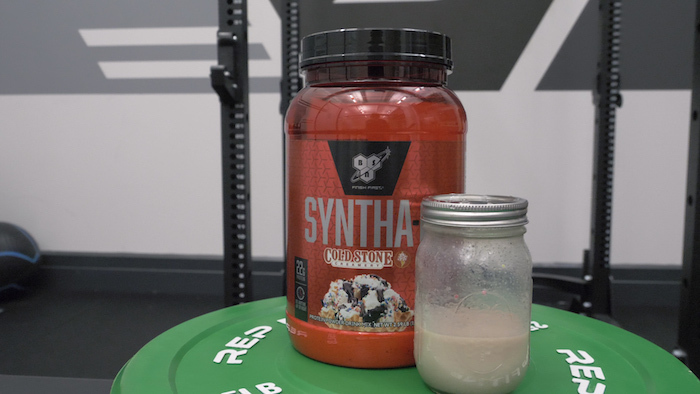 It contains whey (two kinds: concentrate and isolate) but the “Protein Matrix” also has calcium caseinate, micellar casein, milk protein isolate, egg albumen (that’s egg white), and glutamine peptides. The rest of the ingredients include: thickeners and stabilizers like disodium phosphate, artificial sweeteners like sucralose (Splenda®) and acesulfame potassium, artificial colors, and ingredients to help mixability like soy lecithin. There are also ingredients that are probably included for their healthful properties, like tricalcium phosphate (a kind of calcium), bromelain (an enzyme linked to decreased muscle soreness and inflammation), papain (an enzyme to improve digestion), and medium-chain triglyceride fats, as well as ingredients that are kind of in-between, like polydextrose. That’s a type of synthetic fiber, but the jury is out as to whether it has the same benefits as the stuff you’ll find in oats and beans. As far as allergens go, this contains dairy, soy, wheat, egg, and corn (from corn syrup solids). It would be irresponsible to say that just because an ingredient is synthetic, it’s bad for you. 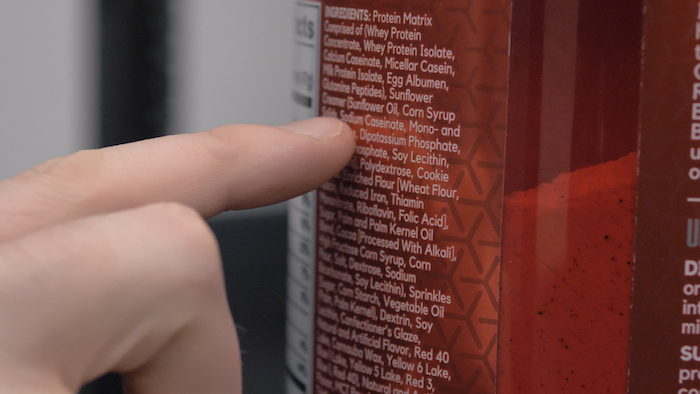 That said, a lot of these additives are controversial among health-conscious folks, so depending on your dietary restrictions (self-imposed or otherwise), the ingredients label may give you pause. The artificial sweeteners, thickeners, and stabilizers and the presence of wheat, soy, and corn may alienate some buyers. The protein itself, meanwhile, provides a full spectrum of amino acids and combines fast, medium, and slow digesting proteins. It’s possible that this makes it more anabolic, but research suggests there’s not much of a practical difference when it comes to muscle gain — what’s more important that the slow digesting proteins, coupled with the fat and fiber, means this may be more filling than your standard isolate. It doesn’t quite fit into the category of a protein and carb shake (which is typically much higher in carbs than protein) or a protein and fat shake. But the fat, fiber, and various kinds of protein should result in a shake that doesn’t spike blood sugar too much. The 2.9-pound tub is between $28 and $33, so it’s between $1 and $1.20 per scoop or, on average, just under 5 cents per gram.The price drops as you order more: a 5-pound tub is closer to $40 which comes to 3.6 cents per gram of protein. That’s quite inexpensive. Per serving, it’s about as cheap as Optimum Nutrition’s Gold Standard and higher in calories, which may be a pro or a con depending on your goals. Owing to all the synthetic thickeners, stabilizers, and mixability-enhancers (like soy lecithin), this mixes exceedingly well. Shake it for ten seconds and enjoy. Chocolate Milkshake: A phenomenlly rich, creamy chocolate that tastes like a milkshake even when mixed with water. Germanchökolätekäke: A richer, darker flavor than the milkshake, this is a lot closer to a super dark chocolate cake than a milkshake. Banana: Banana is a tough flavor to get right with protein shakes, and this is the best one I’ve tried. It’s a tad closer to Tutti Frutti but it goes down like a banana milkshake. Mint Mint Chocolate Chocolate Chip: My least favorite flavor that reminded me a bit too much of toothpaste. The artificial flavors come on a little too strong. Birthday Cake Remix: Less a substitute for vanilla and more akin to a spoonful of frosting, this does taste like you’re licking the top of a cupcake. It’s no small feat for a protein powder to taste great with water, and it’s a big upside to all of the additives that made it happen. 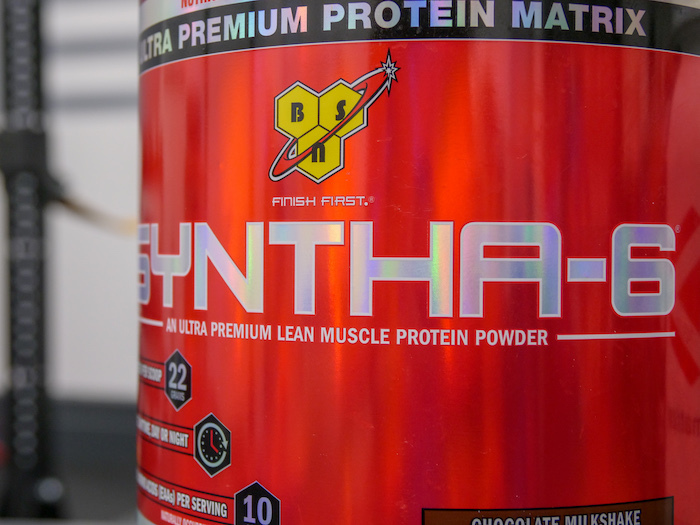 This is a delicious protein powder with a good combination of fast- and slow-digesting proteins. If you follow a diet that restricts artificial ingredients, carbohydrates, or cholesterol, this isn’t the protein powder for you. 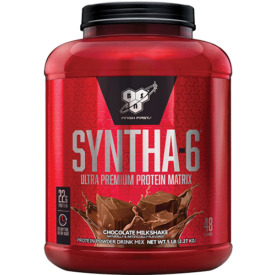 But if your system can digest almost anything and you’re looking for an inexpensive source of protein, Syntha-6 might just fit the bill. 2. Zhou Z, et al. Inhibition of Epithelial TNF-α Receptors by Purified Fruit Bromelain Ameliorates Intestinal Inflammation and Barrier Dysfunction in Colitis. Front Immunol. 2017 Nov 10;8:1468. 3. Pandey S, et al. Anti-inflammatory and immunomodulatory properties of Carica papaya. J Immunotoxicol. 2016 Jul;13(4):590-602. 4. Pavan R, et al. Properties and therapeutic application of bromelain: a review. Biotechnol Res Int. 2012;2012:976203. 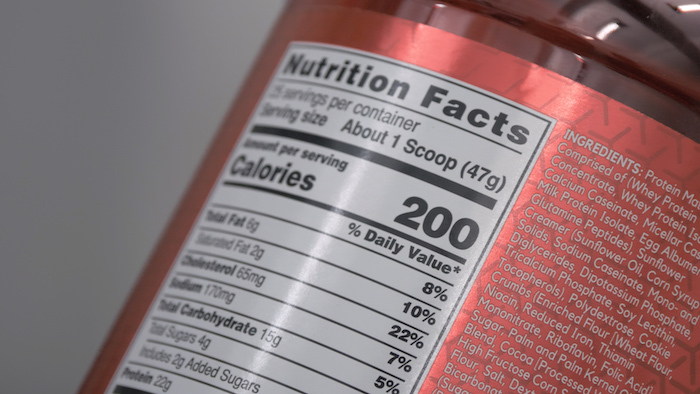 Need more information about sweeter (sucralose and Acesulfame), quantity by portion.